Giant cell arteritis is a primary systemic vasculitis involving large- and medium-sized vessels which affects almost exclusively patients aged 50 years or older. 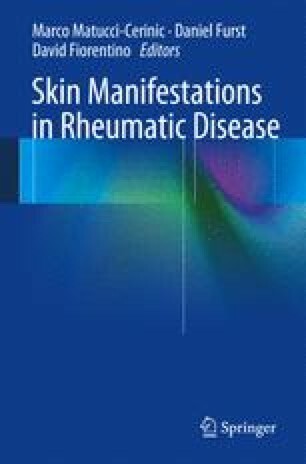 Cutaneous manifestations are rare because giant cell arteritis spares the small vessels, that is, those vessels that are typically associated with skin lesions. The most common skin abnormality observed in giant cell arteritis is thickening and, less frequently, erythema or nodules of the superficial temporal arteries. Necrosis of the scalp and tongue has also been occasionally described in patients with severe vascular ischemia induced by inflammation. Glossitis and facial edema are other rare lesions that reflect active inflammation.